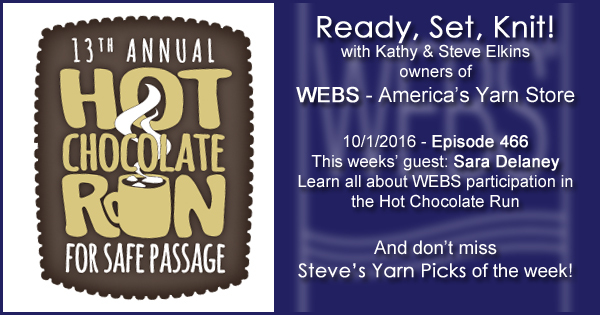 This week Kathy talks with Sara Delaney about Team WEBS fundraising efforts for the Hot Chocolate Run for Safe Passage. This is the 13th year of the event! From a humble start in 2004 with just 500 participants that helped raise $6,000 to an incredible day of fun and unity celebrating our desire to help change and better our communities with 6,000 participants, as well as countless observers and volunteers, that raised almost $500,000 last year. If you’d like to help you can make a donation to Team WEBS here. Or purchase one of these patterns, the full purchase price of each goes directly to Safe Passage! Local Artist, Author, & Designer Meet & Greet is happening today, November 12 from 1:30pm–3:30pm! 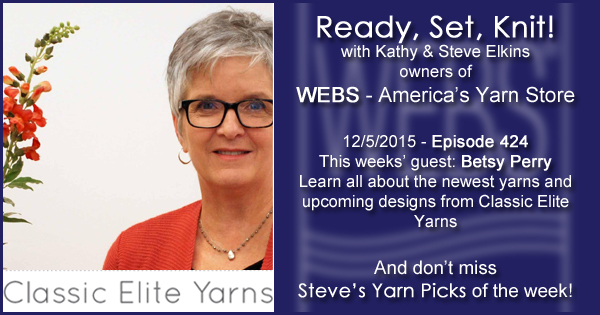 Take advantage of a rare opportunity to shop WEBS on a Sunday. We’ll be open from noon to 5 pm, starting next weekend, November 20 through December 18! Kathy talks with Sarah Smith, Director of Development at Safe Passage about the Hot Chocolate Run for Safe Passage and the prevention work their organization does in Northampton and Hampshire County. Safe Passage was founded in 1977 to provide comprehensive services for victims of domestic violence. Their core mission is to make people feel safe while offering counseling and advocacy programs. 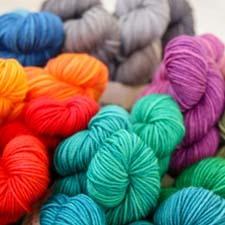 Join Linda Niemeyer of Blue Sky Alpacas for her first ever in-store event! Next week, Sept 27th 1-3pm. The even t is free but please register. It’s time for our 11th annual Knit & Crochet for the Cure! Join us on Oct 5th from 1-4pm. Please remember to register. Spinning and Weaving Week is coming up Oct 6- 11, Lots of workshops and demonstrations to enjoy! 8th Annual Bus Trip to Rhinebeck – Saturday Oct 18th. the busses are filing up, get your ticket now! Every year WEBS participates in the annual Hot Chocolate Run to benefit Safe Passage. This year we’re even more committed to doing good in our community and having fun doing it! 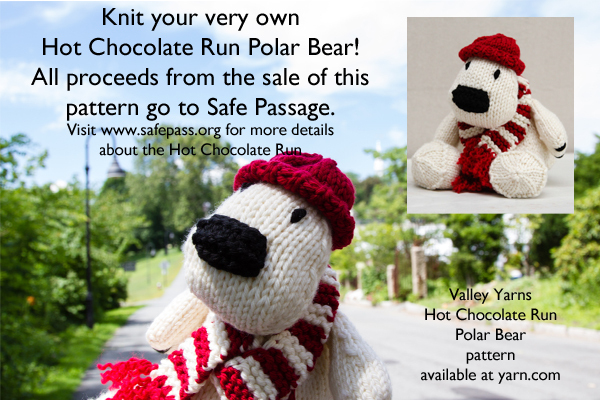 Not only is The Hot Chocolate Run Polar Bear adorable and cuddly soft, being knit in Valley Yarns Superwash Bulky, but all proceeds from the sale of the pattern will go to Safe Passage. 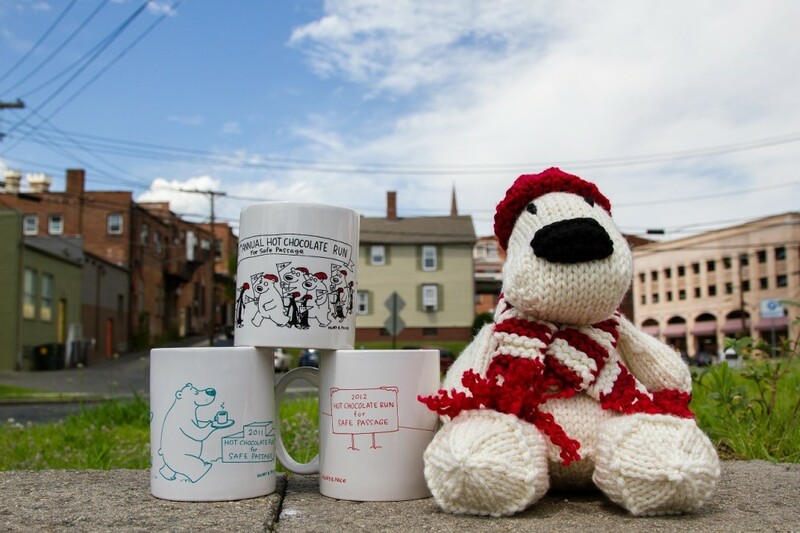 We’ll be keeping track of the Polar Bear’s progress as if the sales of his pattern were donations made to a team member participating in the Hot Chocolate Run.